The first pictures of the Monthly Magazine “Akita Shoten Champion RED” has been revealed, and as it was revealed previously, it will have an especial announcement... Well, it seems that the announcement is that an Anime adaptation of the Manga “Saint Seiya-Saintia Sho-” is in the works! In especific the words “漫画” which means “Cartoon” so in other words... Anime. Still the thing is still a rumor and in a few days we will get either a confirmation or a denial of such things. 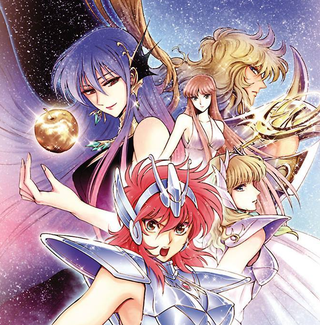 Saintia Sho is an Spinoff of Saint Seiya, which centers in the life of the “Saintias” which where the Maidens in charge of the Goddess Athena. In especifically Sho, becomes a Saintia in order to save her Sister of the hands of Eris, the Goddess of Strife! The manga is also being covered in here.